This study focuses on interviews with educators of trainee physics teachers. Our aim is to expand our understanding of the contexts within which trainee professional identity is performed. To do this, we interviewed teacher educators from different sections of a physics teacher training programme in Sweden, asking how they see the teaching and learning that is carried out there as contributing to the creation of professional physics teachers. We were interested in the implicit ways of understanding the programme as relevant to trainee physics teachers that can be identified in the talk of these teacher educators. The effect of teacher education on the practice of teachers is unclear (Fishman and Davis 2005). Many trainees’ views about science teaching appear to be unchanged by their education, with new teachers instead relying heavily on the apprenticeship of observation (Lortie 1977) where a superficial understanding of what teaching entails, formed during years of general schooling continues to dominate their understanding of how a teacher should act. In fact, it has been shown that trainee teachers are much more likely to change after their education, adapting to the demands of the schools where they are employed (Skamp and Mueller 2001). This calls into question the role of physics teacher education—in what ways is it relevant to becoming a physics teacher? Adopting a perspective that has proven to be increasingly useful over the last two decades, we view learning to become a teacher in terms of the creation of a professional identity (Avraamidou 2014a; Beauchamp and Thomas 2009; Schieble et al. 2015; Sfard and Prusak 2005). From this perspective, questions about the relevance and effects of teacher education become questions about the role that teacher education is expected to play in trainees’ professional identity building (Luehmann 2007). The use of the identity concept in physics teacher education signals a view that becoming a teacher involves more than gaining a certain amount of pre-defined pedagogical content knowledge (Berry et al. 2015; Shulman 1987)—rather, becoming a physics teacher may also be viewed in terms of participating and being recognised within the professional discourses of physics teaching (Luehmann 2007). In this respect, theories about identity can be powerful analytical tools that allow researchers to connect the practice of individual teacher educators or trainees with more general, overarching structures, addressing the interplay of individual agency and sociocultural context (Sfard and Prusak 2005). Although this aspect has been addressed theoretically, it has been suggested that there has been an empirical preoccupation with the individual trainee, which has neglected the role that the wider training context plays in structuring individual agency (Shanahan 2009). Thus, in a recent review of research on science teacher identity, Avraamidou (2014a) found that the contexts in which science teacher identities are formed are often overlooked. What discourse models (here ways of making sense of the education of physics teachers) can be identified in the talk of the teacher educators that trainee physics teachers meet during teacher training? What physics teacher identity performances might we expect to be recognised and valued within these discourse models? In order to address these questions, we interviewed a total of nine teacher educators working in three different parts of a physics teacher programme in Sweden. The international decline in students taking physics is of great concern (European Commission 2015; Forsman 2015). Of these students, even fewer are choosing the teaching profession, leading to a serious shortage of physics teachers (Osborne and Dillon 2008; Task Force on Teacher Education in Physics 2012). Recently in the USA, the report of the Task Force on Teacher Education in Physics (2012) drew attention to this problem and called for action to increase not only the number, but also the quality of students entering physics teacher training. Similar calls for action had already been made in the European countries, with the education of new physics teachers being identified as one of the key instruments for change in terms of increasing physics student recruitment along with better physics literacy in society as a whole (European Commission 2004; European Commission Expert Group 2007). If new physics teachers are to be the instruments of change in this way, then the quality and organisation of physics teacher education programmes becomes key. What should trainee physics teachers learn, and how should teacher training programmes be organised? In what follows, we attempt to summarise what we see as the main strands of research in this area, with a particular focus on studies concerning teacher education as a context for identity building. First, a substantial amount of literature has focused on good practice in physics teacher education, seeking to develop, implement and spread these practices. Here, we find studies focused on the design of instructional units concerned with the teaching of conceptual and procedural physics knowledge within teacher education (Aiello-Nicosia and Sperandeo-Mineo 2000; Mäntylä 2012; Mäntylä and Koponen 2007) as well as studies that develop models for physics teacher education programmes as a whole (Etkina 2005; McDermott 1990; Otero et al. 2006; Singh et al. 2010; Thomaz and Gilbert 1989). Examples of the latter include the UTeach programme developed at the University of Texas and the Learning Assistant programme developed at the University of Colorado. Both these initiatives aim to encourage undergraduate science students to pursue a career in teaching, with a focus on combining educational theory and practice with science content knowledge. A major aim of these programmes has been to demonstrate the relevance of educational research for actual classroom teaching and learning through collaboration between education and subject matter scholars. This kind of working collaboration between physics departments and education departments is one factor that has been suggested as contributing to good quality physics teacher education (Sandifer and Brewe 2015, p. 3). These initiatives are a response to research that reports physics teacher education programmes as fragmented, finding very little communication between the different sections of the educational programmes (Scherr et al. 2015; Task Force on Teacher Education in Physics 2012). One way of explicitly framing the connection between educational theories, classroom practices and physics content knowledge is ‘pedagogical content knowledge’ (Berry et al. 2015; Shulman 1986, 1987) a concept that has been influential in the development and evaluation of physics teacher education (Etkina 2010). The studies described in the previous section are engaged in a very direct way with developing good practice for physics teacher education and have a varying degree of grounding in educational theories. Another main strand of research takes a meta-approach to the issue of bridging the theory/practice divide in physics teacher education, seeking to understand the fragmentation of physics teacher education programmes. These studies explore the connections between different aspects of the programme from the perspective of both university teachers and trainees. Here, it has been shown that there is often a lack of commitment to physics teacher education in physics departments (Task Force on Teacher Education in Physics 2012). In an interview study about the condition of physics teacher education programmes in the USA, Scherr et al. (2015) asked physics faculty about perceived barriers to raising the number of physics teacher graduates. The main barriers mentioned by physics faculty were that teacher education was not considered a priority in their institution and that students interested in teaching still preferred to complete a degree in pure science. In general, faculty attitudes towards teaching were found to be negative. Some faculty viewed students choosing a teaching career as less able than other students, whilst physics students themselves were dissatisfied with their education courses because they did not feel they were relevant to teaching physics. The faculty also reported problems collaborating with the education department. This seems to be a widespread issue, for example in Hökkä and Eteläpelto’s (2014) study of a well-regarded Finnish teacher education programme, that has no problem recruiting students, the authors found that collaboration and communication between teacher educators was lacking, especially across subject groups. The theory practice gap in teacher education has been discussed at length in the literature (Korthagen 2007). The notion that the pedagogical part of teacher education is too theoretical and therefore not valued by trainees has now been well-established (Allen 2009). For example, Sjølie (2014) found secondary pre-service teachers with a subject specialisation within science were more negative towards educational theory than trainees with a language specialisation. Similarly, Molander and Hamza (2018) found that trainee teachers with a strong science background had difficulties seeing the value of educational theory. McGarr et al. (2017) suggest that there is a difference between trainees actually internalising educational theory or just accepting it. They suggest that acceptance of theory (talking positively about it) without internalisation (applying it to one’s own practice) might be due to accepting the legitimacy of teacher educators rather than the educational theory itself. The physics teacher education programme in focus in this paper shares some of the same characteristics described in the literature. The programme takes place in three environments, the physics department, the education department and school where pre-service teachers do their practicum. Following the research overview above, we expected that our analysis of this teacher education programme would shed light on problems of fragmentation with a lack of communication and shared goals across these three environments. We were particularly interested in the potential consequences of any lack of shared goals for trainees’ possibilities to perform professional physics teacher identities within the programme. The approaches to studying physics teacher education described thus far have focused on the relationship between practice, content knowledge and educational theory. However, in the words of Bullough and Gitlin (2001, p. 3) “Teaching is a relationship, a way of being with and relating to others and not merely an expression of having mastered a set of content-related delivery skills.” A good example of how the interplay between teacher identity and context can be addressed is the study by Saka et al. (2013). Here, the authors found that the reformed-minded teacher identity developed in trainees’ educational programme interfered with their ability to take advantage of support systems and resources in school (cf. Carlone et al. 2010). This study, and others that deal with school as a context for new teacher identity formation (cf. Danielsson and Warwick 2014a; Olsen 2008; Varelas et al. 2005) point to the need for trainees to have the opportunity to explicitly reflect on their identity during education in order to prepare for identity conflicts when meeting the often very different discourses of the school. This call is taken up by another strand of research concerned with how to help trainees to develop a professional identity as part of their educational programme (Beauchamp and Thomas 2010). Schieble et al. (2015) showed for example how video analysis and discourse analysis can be used to encourage identity work amongst trainees. However, in this paper, we argue that who the trainees express themselves as preferring to be cannot be said to be independent of the environments in which these struggles are played out. Rather, as Sfard and Prusak (2005, p. 833) argue, trainee teachers meet and interact with a number of “significant narrators” when participating in teacher education, who all in different ways can be expected to influence the identity formation process. Our interest then is in the ways that educational programmes encourage and limit the possible future selves the trainees can imagine. A substantial strand of research has explored the way in which primary teachers form identities as teachers of science (Avraamidou 2014b; Lunn and Solomon 2000; Moore 2007; Smith 2007). Danielson and Warwick (2014a, b) show how discourses around science teaching and primary teaching can create tensions and limit the subject positions (identities, ways of being a teacher of science) available to primary teachers. In other work Søreide (2007) analysed primary school policy documents as a context for primary teacher identity construction in Norway, asking what narrative plots about primary teachers were told in the documents. These narrative plots, along with other constructs (identities, subject positions) in her work are seen as functioning as narrative resources for teacher identity construction. In a similar vein in this paper, we focus on the discourses of a physics teacher training programme in order to examine the affordances and constraints for professional identity performance made available in the programme. In this study, we are interested in the context within which the professional identity performances of trainees are carried out. We view becoming a professional teacher as a process where trainees learn to participate in recognisable ways in the discourses of the system within which they find themselves, first in physics teacher education and later in schools. Here, we follow the dominant view within teacher education research that treats identity as socially constructed, dynamic, fluid and multifaceted (Avraamidou 2014a; Shanahan 2009). There are multiple ways of conceptualising discourses. For this paper we have chosen to use James Paul Gee’s (2005) rather broad interpretation that draws on the work of several scholars in order to create working tools for discourse analysis. Gee defines discourse as the ways in which meaning is made through language, that is, how language is used to say, do and be certain things. Gee (2011) uses the term situated identity to describe the different ways of being someone we take on in different situations. Even though we use Gee’s discourse analysis, in this paper, we chose not to use the term situated identity but rather speak of identity in terms of identity performances (Archer et al. 2017; Butler 1990; Davies 2006). Identity is the means by which a person constructs an image of themselves as consistent and making sense. This construction is dependent on the ways of being someone that are recognisable and valued within dominant discourses. To be recognisable, an identity has to align with the dominant discourse and be understood on the basis of the taken-for-granted assumptions within that particular discourse. Following Archer et al. (2017), we use Butler’s (1990) concept of identity performances to understand how trainee identities are created within and limited by the dominant discourses of their programme. Performing an identity is necessary for becoming a subject with agency, it opens up a set of available ways of using language for making meaning. However, performing a recognisable identity also means submitting to the dominant discourse, being limited to the specific ways of meaning-making available in that discourse (Davies 2006). Being a professional physics teacher means performing an identity within specific professional discourses, it is thus this professional context that distinguishes a professional identity from any other kind of identity. Performing a recognisable professional identity is what Gee calls ‘pulling off’ a discourse (Gee 2011, p. 35). In our case, this would entail being recognised as an aspiring professional teacher within the dominant discourses of the physics teacher-training programme. Note the double meaning of recognition in the way we use it here. Being recognised can mean not only being acknowledged and valued but also comprehensible or understandable. For trainee physics teachers, both these aspects of recognition are important, and to be successful, they need to perform an understandable teacher identity that is also valued in the system. To summarise, discourse influences professional identity by dictating which identity performances are recognised and valued, simultaneously enabling and limiting possible ways of being and becoming a physics teacher within the physics teacher education programme. We are interested in the dominant discourses that we can identify in the talk of physics teacher educators, and how they enable and limit ways of performing a professional teacher identity. Analytically, we characterise these discourses in terms of discourse models. In order to describe and operationalise how the discourses of teacher education enable and limit different professional teacher identity performances, we use Gee’s (2005) concept of discourse models. Gee (2005, p. 71) describes discourse models as “images or storylines or descriptions of simplified worlds in which prototypical events unfold. They are our ‘first thoughts’ or taken-for-granted assumptions about what is ‘typical’ or ‘normal’”. Discourse models are what we use to make sense of what happens and what people say. They are unconscious explanations that show the normal or typical case or chain of events we expect. Such discourse models are invoked constantly. Different situations call for different explanations of the same thing. Thus, it is not uncommon to identify competing discourse models and for the talk of an individual to be inconsistent when moving between models as contexts change. Clearly, however, not every model can be invoked in every context. Thus, context limits the discourse models that are available for making sense of a particular practice. Using Gee’s discourse analytical approach means assuming that all people make sense within their own frame of reference. Thus, identifying discourse models involves understanding what is needed for a particular piece of talk to make sense. Looking for discourse models in a transcript, then, means looking for what the informants need to take for granted or ‘know’ for their story to be comprehensible. Gee (2005, p. 93) suggests asking “What must I, as an analyst assume that people feel, value and believe, consciously or not, in order to talk (write) act, and/or interact this way?”. In our case, each model we identify has an intended goal—a kind of stereotypical professional—that appears to be (consciously or unconsciously) structuring the talk of the teacher educators invoking the model. One way of thinking about discourse models is to see them as selective filters, where each model represents a default focus on particular aspects of the collection of institutional discourses (such as the curriculum and other policy documents) and more local discourses, available in the programme environment. Following Gee, discourse models thus reflect default positions or ‘taken for granted assumptions’ about which aspects and interpretations of local and global discourses are important in a given educational context. Our study was carried out in the upper secondary physics teacher programme at a large research-oriented Swedish university. Physics teacher education in Sweden is mainly the responsibility of higher education institutions, and it is this kind of teacher education that is the focus in this paper. The upper secondary physics teacher degree is composed of three parts, educational science, school placement and subject matter studies. The study programme consists of 1 year of educational science, one semester of school placement and three and a half years of subject matter studies, 2 years of physics and 1.5 years of mathematics. For students who already have the required knowledge in the subjects, another path is the supplementary teacher education, which consists of two semesters of educational science and one semester of school placement. As in many countries, and most programmes in Sweden, physics teacher education in this particular university is carried out across three physically separate environments; the education department, the physics department and the upper secondary schools where trainee teachers do their practicum. This entails trainees attending a range of courses during ten semesters whilst alternating between the three environments. We argue that the physical separation of educational theory, subject studies and practicum in this system provides an opportunity for us to study the potentially conflicting discourses of teacher education. At the physics department trainees take courses in physics, most of them taken together with the bachelor programme in physics. Very few courses are designed especially for trainee teachers. Here, the courses are taught by lecturers at the physics department, from now on called physics lecturers. The physics lecturers are thus university employees with a PhD in physics who with few exceptions do research in physics as well as teach physics courses. At the education department trainee physics teachers take courses touching on, amongst other things, the history of education, pedagogical leadership, assessment and curriculum studies. These pedagogical courses are taken together with upper secondary trainee teachers from all subject specialisations. The lecturers teaching these courses, hereafter called the education lecturers, are either researchers in education or school teachers dividing their time between school and teacher education. In school during practicum, trainee physics teachers are assigned a mentor, usually an upper secondary physics or mathematics teacher. The mentors are recruited from local schools and the ambition is that mentors should be qualified physics teachers with extensive teaching experience. Mentors also take part in an introductory course given by the education department; however, this course is not mandatory. Mentors are supposed to be given time to cover for their mentoring. In reality, mentors are hard to recruit and schools are short of money, resulting in mentors seldom being given enough time to tutor the student or to participate in the introductory course. The practicum consists of three separate periods. In the first period trainees are expected to observe and discuss the teaching of their mentors as well as complete assignments for the education department. During the subsequent practicum periods that take place in years 4 and 5, trainees are expected to independently take responsibility for an increasing part of the teaching of their mentors. They also complete assignments for each practicum. In year 4, this assignment is coordinated by the physics department and in year 5, by the education department. To allow for us to do in-depth analysis (Kvale and Brinkmann 2009), we chose to limit our interviews to a total of nine teacher educators from the three environments: three physics lecturers, three education lecturers and three mentors. Henceforth, these interviewees will be collectively referred to as the educators. Thus, we have three educators from each of the three environments. This is of course a small sample; however, in this study, we were not attempting to provide a generalisable description of the state of physics teacher education in Sweden, but rather to illustrate the potentially competing discourses of a physics teacher education programme. As such, the work presented here can be thought of as a case study chosen on the basis of information (Flyvbjerg 2006). As pointed out in the research background, earlier work has highlighted the problem of integrating subject matter, educational theory and school practice into one coherent programme, suggesting fragmentation and competing discourses are often inherent in teacher education (Danielsson and Warwick 2014a, b; Hökkä and Eteläpelto 2014; Sandifer and Brewe 2015; Scherr et al. 2015; Sjølie 2014). In our particular educational programme, these parts are physically separated, located on different campuses. Whilst this is thus an extreme case, we argue that it is, in fact a particularly fruitful arrangement for studying the competing discourses and fragmentation of physics teacher education. In choosing the education lecturers, we made sure that they all had experience of teaching introductory and major courses. Similarly, the physics lecturers we chose teach major physics courses, taken by both trainee physics teachers and bachelor students. The education and physics lecturers were recruited using our contacts within the university system. The practicum mentors were found using a list of all local mentors. Typically, mentors have very full timetables and do not receive extra time to work with trainees. This made it difficult to find mentors who would prioritise participating in the study. In the end, the first three mentors on the list to agree to be interviewed were selected. Fortunately, these mentors did have varying experiences of teaching and mentoring. One of the mentors was quite new both as a teacher and mentor, whilst two were more experienced. The interviews were carried out in Swedish, lasted between 60 and 90 min and took place in an environment chosen by the educator. In compliance with Swedish Ethical Research Standards (Swedish Research Council 2017), the educators were informed of the purpose of the study, their right to withdraw at any time, were guaranteed confidentiality and gave consent to be recorded during the interview. The in-depth, semi-structured interviews were guided by three themes designed to explore the ways in which the educators construed physics teacher education as more or less valuable for creating professional physics teachers. The most relevant theme for this study became “What new physics teachers need to take with them from the educational programme.” Here, we discussed the practice and purpose of the teaching that the educators were involved in, as well as the other parts of teacher programme. The educators also talked about the purpose of the educational programme in general, its most important parts and whether something was missing. The second theme, “The general physics teacher,” involved questions around ideal pictures of a physics teacher as well as worst case scenarios. The last theme, “Choosing to become a physics teacher” involved discussions around what motivates trainees to become physics teachers contrasted against other choices such as a teacher of another subject or a physicist. All the authors are educational researchers either in the physics department or the education department and the first author has completed the physics teacher programme at the university we studied, which implies close familiarity with the practices and discourses of the educational programme. This is, of course, both a strength and a weakness. As Mercer (2007) argues, being an insider in relation to a research site should be considered a continuum where the degree of insiderness can vary not only between interviews but also during an interview. In this case, for the first author being part of the physics department, having completed the physics teacher-training programme and doing educational research are all things that made the environments of the interviewed educators familiar. This provided the possibility to interpret the interviews drawing on a common frame of reference and also allowed easy access to the system. On the other hand, this kind of familiarity may, of course, lead to blindness to shared frames of reference and difficulties in appreciating different perspectives on the system. On balance, we believe this is a strength rather than a weakness of the study. Initially, the interviews were transcribed verbatim and iteratively coded in QRS NVivo 10, a qualitative data analysis software package. The language used in both interviews and transcripts was Swedish and all English quotes in this paper are translations. In the translation process, care was taken to keep the original meaning of the quote rather than literal word-for-word translation. The quotes have been edited to enhance understanding, leaving out for example repetitions and false starts. To begin our analysis, the transcripts were read through in their entirety and then in the first round coded very generally and associatively, sorting the material into tentative categories of repeating themes, thoughts, differences and similarities. This first open coding served as a way of moving from viewing the interviews as separate units towards getting a feel for the material as a whole. It was also a way of distancing ourselves from the very familiar material (Jørgensen and Phillips 2002). Starting from the categories created in the first round, in the second round of coding, we focused on how the different parts of teacher education were comprehended as relevant to the goals of the educational programme. For example, in the quote below, one of the lecturers at the education department is discussing what the physics courses should ideally cover. I think that [the physics courses] should adjust to the goals of schooling. […] in practice this means what is in the curriculum. With some elaboration. So to a large extent [...] secondary teacher education should adjust to the demands, values, and directives of the school physics curriculum. This statement was understood as judging the value of university physics courses in terms of their suitability for preparing trainees to teach what is set out in the school curriculum. Gee (2005) suggests that when carrying out analysis we should ask ourselves what discourse models have been used to make value judgments. Here, the physics courses are judged as a means to a particular end—the implementation of the curriculum. This statement was initially coded as subject according to syllabus and later became part of the curriculum implementer discourse model that we present in the findings section. The second round of coding was very open and resulted in a comprehensive revision of the categories, where some categories were recognised as more significant whilst others were decided to represent side-tracks that would not be the focus of further analysis. The significant categories were then refined and merged into larger categories in an iterative process resulting in four separate systems of meaning, the discourse models. What the coded quotes in each discourse model had in common was that they all, more or less explicitly, indicated the same system of underlying understanding about the goal of physics teacher education. The material was then read through again and recoded, now with the models as a starting point. Quotes were connected to the models in a visual representation that was then used as the starting-point for discussions amongst the researchers, testing and refining each model to reflect what we were seeing in the transcripts. In the analysis, more than one of the four discourse models could be identified in the talk of each individual educator. The models can thus be seen as ways of understanding the educational programme that the educators move between and use in different ways. This is not a conscious process and the models should not be seen as characteristics belonging to the individual educators. Rather, the discourse models are an analytical device (Jørgensen and Phillips 2002) that we use to delineate the different and sometimes incompatible ways of making sense of the educational programme that we have identified in the talk of the educators. Our analysis of the interviews resulted in the construction of four discourse models: The practically well-equipped teacher model, The critically reflective teacher model, The curriculum implementer model and The physics expert model. Each model frames physics teacher education in terms of a goal—a particular kind of professional. These different goals mean that the various parts of the educational programme appear more or less relevant—depending on the model being used at the time. The models thus represent logical systems of meaning where practice is understood with reference to what the educational programme is striving to achieve. In some cases, a given discourse model offers no ways of understanding the relevance of a particular part of the programme at all. This means that in order to make sense of that part of the educational programme, another model would need to be used. As we will see, the same educational input can therefore be interpreted in quite different ways depending on which discourse model is being invoked. In the figures accompanying the models, goals are represented by blue rectangles and educational input by green rectangles. For each of the four discourse models, we will present the overarching goal and then discuss the ways in which the different parts of physics teacher education are interpreted within the model. For each model, we also show how different identity performances are recognised and valued. We conclude the presentation of each model by discussing how it was invoked and negotiated by the teacher educators. In this model, the goal of the educational programme is to create physics teachers who can do the work of a teacher on a day-to-day basis. Here, it is the practicum and pedagogical courses that are potentially important. A diagrammatic representation of the model is shown in Fig. 1. To succeed in reaching the goal of the practically well-equipped teacher model, the programme needs to teach tools and practical knowledge, as illustrated by the following quotes. Interviewer: when they’ve finished the programme, what do you think they need to take with them? How am I to organize my teaching then? How am I to know whether to work with group assignments or small projects? Or how do you get kids to write decent lab reports? [The goal is to], on an everyday basis, discuss all of these choices you face as a teacher. In the practically well-equipped teacher discourse model, the acquisition of practical knowledge is seen as something that is missing from the majority of the programme. For example the educator quoted above goes on to regret that the practical things mentioned are not taught more in the educational programme—only really occurring during the practicum. The educational programme as a whole is thus perceived as problematic within this model. In the practically well-equipped teacher model, the university-based pedagogical courses should ideally prepare trainees for their time in school. However, the theoretical nature of these courses means that this does not happen. This part of the programme is therefore viewed as peripheral at best. The following quote from one of the mentors illustrates this point. [The trainee teachers] often had with them assignments [...] that were somewhat unclear and I guess that is typical, you feel that […] they have a very theoretical view of learning and they don’t really know the conditions in school, so often the assignments were really nonsense. Not that I have anything against researchers, but some of them—there were some that I met in [the education department] who were PhD students and so on—who chose not to become teachers because they couldn't handle a real classroom so they decided to do research about classrooms instead, without any real practical experience. (...) A lot of the teachers at [the education department] didn’t really have...they'd never been out and taught themselves and so on, but they seemed to have a lot of nice theories about everything. In Fig. 1, this relationship is illustrated by the solid arrow pointing from practicum to the goal and the broken arrow between the pedagogical courses and the goal. Interestingly, in this model, the physics courses were not mentioned at all. This may suggest an emphasis on a generic goal of creating teachers regardless of subject specialisation. Whilst in agreement with the logic of the model, this particular explanation of the absence of physics is not a result of our analysis. The physics courses were simply not mentioned in the context of this model and therefore we cannot say how these courses might be conceptualised within in the model. In the practically well-equipped teacher model then, identity performances on the theme of a well-prepared teacher would be valued. This would entail demonstrating knowledge about the practical nuts and bolts of the job that teachers are expected to perform in schools. However, since the model frames the educational programme as not providing the tools needed to reach this goal, it is probably difficult to ‘pull off’ this practically well-equipped teacher identity performance (at least on the basis on the programme). A much less valued but probably more easily accomplished identity performance within this model would be that of a practically ill-equipped teacher. Here, the trainee would be seen as entering the teaching profession without important knowledge needed to do the job and probably understanding most of the time spent in teacher education as wasted. All the educators we interviewed used the practically well-equipped teacher model in some way, but the model was constructed to a large extent from the talk of the mentors in school. We therefore suggest that in the context of our study, identity performances recognised within the practically well-equipped teacher model are likely to be recognised in the school context. When the mentors use this model they reject the pedagogical courses as worthless, suggesting that it is only during the practicum that trainee teachers find out what teaching really is. The education lecturers on the other hand negotiate this model in more ambivalent ways, either regretting that they cannot teach in a more practically oriented manner, or expressing suspicion towards the mentor teachers’ ability to teach these aspects. The physics lecturers on the other hand all employ this model to talk about the dull everyday work of a teacher. In contrast to the other educators, the physics lecturers do not explicitly discuss how these day-to-day aspects should be handled within the programme. In the critically reflective teacher model, represented graphically in Fig. 2, the goal is to give trainees the theoretical tools they need to critically reflect upon their own practice. This model and the practically well-equipped teacher model can be viewed as being on opposite sides of a fundamental dichotomy of theory and practice that was very pronounced in the interviews. In particular, the education lecturers all relate to this theory vs. practice dilemma in some way. For example in the following quote, one of the education lecturers discusses why actual practical ways of teaching are not taught in the education department. The danger of teaching practical skills is that it is all too easy to reproduce subject traditions. […] And then you don’t want to teach practical things at all for fear of becoming unscientific. This quote highlights the logical structure of the critically reflective teacher model. If the goal of the educational programme is to create teachers who question the accepted ways of teaching their subject, then teaching tried and trusted practical skills (those valued by the practically well-equipped teacher model) becomes problematic. In the critically reflective teacher model physics teachers should view both school physics and university physics as socially created practices. Trainee teachers need to learn to see their subject in a critical way in order to avoid reproducing traditional ways of teaching that might be destructive. I always say this when I meet the specialist teachers. Now you have a lot of subject knowledge. But, what you might also need to do is to problematize this content. So that you don’t reproduce an existing structure and, yes all of that. Another education lecturer discusses this same aspect. In my lectures I always discuss how to break free from the teaching traditions that the trainees carry with them because that's the kind of exam or whatever that they did when they were in school. In most cases the ones who choose to be teachers, these [teaching practices] have worked for them, it suited them pretty well. To be recognised as professional within the critically reflective teacher model, trainee teachers should reflect on questions such as: How was physics created? Why is it normally taught in this way and what are the consequences of that? In this model, the traditional, accepted ways of doing things need to be questioned from all possible angles. In the critically reflective teacher model, the pedagogical courses are relevant since they are comprehended as giving trainees the theoretical tools they need to be critically reflective. The practicum on the other hand is highly problematic in this model, since trainees participate in the very practices that they should be critically challenging. The same is also true of the physics courses. In both cases, trainee physics teachers risk taking on the traditions that the model suggests they need to be critical towards. This quote illustrates how the education of physics teachers in the critically reflective teacher model is also framed in terms of preparing trainees to be agents for change. The model thus inherently strives for reform. It is only through learning to be critical that trainees can avoid becoming an unquestioning participant in the school system. Thus, the critically reflective teacher model values identity performances based around helping to change the education system for the better. The critically reflective teacher model could not be identified in the interviews with mentor teachers or physics lecturers. Thus, whilst the practically well-equipped teacher model seems to be a model that can potentially be invoked in all contexts, the critically reflective teacher model could only be clearly seen in the interviews with the education lecturers. In the curriculum implementer model, the goal of teacher training is to create ‘civil servants’ whose mission is to implement the curriculum. A diagrammatic representation of the model can be seen in Fig. 3. Here, a teacher’s job is both to teach the specific content set out in the syllabus and also to meet a long list of demands that can be found in policy documents. One of the educators from the education department says. I think you have to understand the task you have been given as a teacher. It doesn’t matter whether you are becoming a physics teacher, Swedish teacher or preschool teacher or whatever you’re aiming for […] I think that every teacher needs to understand what their task is. ‘What is my role really?’ I think that is the fundamental issue. The task given to a teacher involves not only meeting subject-specific learning goals, but also includes wider issues of implementing the core values of the curriculum. [Trainee teachers] need to connect their subject to what is in the curriculum. That is, what is intended when the policy documents speak [...] about socialization—creating democratic citizens? […] What is the significance of physics or mathematics or Swedish or English in reaching that? In this model, the school subject physics is seen as a tool for achieving a higher goal—the production of democratic citizens. A physics teacher’s role is to serve society by operationalising the values expressed in the curriculum. Two types of educational input are seen as potentially helping to implement the goals of the curriculum implementer model; pedagogical courses and something that the educators describe as missing from the programme, that we term syllabus physics. Syllabus physics does not actually exist as part of the educational programme we studied. This is therefore represented in Fig. 3 by the lighter colour and arrow. In the curriculum implementer model, it is in the pedagogical courses that trainee teachers learn to interpret and implement the curriculum. For example a course on assessment should provide practical knowledge about how to assess according to the syllabus along with an understanding of the role of assessment in the curriculum. Notice how this way of interpreting this course is quite different from what would be expected from within the critically reflective teacher model where learning about assessment would entail deconstructing the assessment system or questioning the knowledge claims of written exams. Where the critically reflective teacher model emphasises questioning and reforming practice, the curriculum implementer model focuses on understanding and implementing the curriculum. The second type of educational input that could potentially contribute to meeting the goal of the curriculum implementer model is what we call syllabus physics. This is not actually a part of the programme at the moment, rather it is mentioned by the education lecturers as something that is lacking. In the following quote syllabus physics is discussed by one of the education lecturers. The notion of syllabus physics is grounded in the concrete physics that pupils are expected to learn in school, and includes reflection about how this physics can be used to meet the values expressed in the curriculum. It is not certain however, that physics teachers in school in the end actually teach what is in the curriculum. This is also something that is considered a problem in the curriculum implementer model. One problem I have with a lot of teachers, and this is not only but maybe especially natural science teachers [...], is that they focus on getting through the book. They want to finish the chapter, they've got an idea that there is this content that needs to be got through that doesn't necessarily bear any resemblance really to what's actually in the new policy documents or the curriculum or the syllabus. In the curriculum implementer model, the physics courses that are actually given by the physics department are seen as so disconnected from what is needed for the creation of future physics teachers that something totally different (syllabus physics) is invented. So, whilst in the first two models (Figs. 1 and 2) we use a broken arrow to denote a part of the education that could potentially contribute to the goal of those models, here we have chosen not to represent the physics courses in this way. Rather we have included syllabus physics (represented in lighter tones) to emphasise the expressed incommensurability between this (invented) content and the actual physics courses that trainees take. Within the curriculum implementer model then, all three environments of the teacher education programme (physics department, education department and practicum) could potentially be framed as having some role to play in creating a physics teacher. The pedagogical courses are relevant when they focus on policy documents, the practicum is relevant as a way to practice implementing these policy documents and the physics courses should be totally reformed so that they deal with the physics that is in the school syllabus. In this respect, the curriculum implementer model is the only model that potentially contains a possible way of viewing the system of physics teacher education as a working whole. When taking the assumptions of the curriculum implementer model for granted, identity performances where a teacher is framed as a public servant are valued. Performing a public servant identity allows the trainee to draw on large parts of the teacher programme and involves playing a relatively well-defined role. However, there is a risk that this position may be disempowering since the responsibility for what is learned lies, not with the teacher, but with the writers of the curriculum. In our analysis, the curriculum implementer model has mainly been constructed from the talk of the education lecturers, however, it could also be seen as a functioning discourse model in the talk of the mentor teachers. The physics expert model differs from our other three models in that it has a very different goal. Whilst the curriculum implementer, practically well-equipped teacher and critically reflective teacher models all refer directly to a kind of professional teacher stereotype, the physics expert model focuses on the creation of physics experts. At first glance a discourse model that does not aim to create any kind of teacher, but rather has the production of physics experts as its goal, appears totally unrelated to physics teacher education. However, in our analysis we saw the physics expert discourse model repeatedly used to frame the relevance of physics teacher education. In the physics expert discourse model, the goal is to create someone who does research or works with technical applications of physics. This kind of work in physics is understood as exciting and desirable. What everyone really wants to work with is research. You want to do something that is new and creative. That’s got to be the goal for most people, right? To just repeat what others have done feels—that’s second order, it’s not the same thing. Then of course it can be important and useful but it’s still not like the teachers contribute to the country’s GDP. This quote from a mentor shows how an ambition to become a “real physicist” is expected within the physics expert discourse model. The creation of physics experts is also the only goal available in this model. Clearly, teaching physics is something that needs to be done in order to create these physics experts, but being a physics teacher cannot be framed as something to aspire to. Note that this does not mean that the creation of physics teachers cannot be explained using the physics expert discourse model, but the choice to become a teacher can only be viewed as less than optimal. A diagrammatic representation of the physics expert discourse model is shown in Fig. 4. The theme that becoming a physics teacher entails diverting from the expected goal of becoming a physics expert was evident in several of the interviews. In some cases, as in the earlier quote, this was even explicitly expressed. In most cases, however, the goal of the physics expert discourse model only really became clear during our analysis. In what follows we give one example of the way in which the physics expert discourse model was created in order to articulate patterns of tacit understanding expressed in our interview data. It is usual that trainee physics teachers read their physics courses together with students on other programmes. In one of the interviews a physics lecturer talked about one such mixed course where guest lecturers were recruited to inspire the different groups of students. The lecturer explains how care was taken to recruit people from different areas to capture the different ambitions of students. Interestingly, trainee teachers were not mentioned even though there were a number of trainee physics teachers in the group. When asked who might be brought to the lecture to inspire the trainee teachers in the course, the answer was: “I don’t know”. It was clear that for the lecturer, it was hard to imagine how people could be inspired by referring to a future as a physics teacher. Through our analysis we came to interpret the absence of a guest lecturer as a role model for teachers in this course in terms of the incommensurability of the role of a physics teacher with the default goal of becoming a physics expert. As we mentioned earlier, we use the concept of discourse models as an analytical tool, asking what is needed for a piece of talk to make sense. In this case, the goal of the physics expert discourse model helps us understand the absence of a guest lecturer for the trainee physics teachers. In our analysis, many of the different stories told by educators in the interviews could be understood by appealing to this model. In the physics expert discourse model, the physics courses that are taken by trainees as part of the physics teacher programme are not primarily understood as such, rather they are seen as courses on physics bachelor and engineering programmes. The physics courses are clearly framed as relevant in the physics expert model since they have the goal of creating future physics experts. However, using this model does not allow us to make sense of the courses in the education department and the practicum. This is why these educational inputs are missing from Fig. 4. How, then are trainee physics teachers understood in the physics expert discourse model? A trainee physics teacher is someone who, for some reason does not follow the path to the goal—the physics expert. Within the physics expert discourse model, at least two rationalisations of this decision are possible: either trainees do not have what it takes to become physicists, or perhaps they are driven by a cause—to encourage new students to take physics and become future physics experts. In this latter case, a physics teacher should inspire students to take physics at university level. This sentiment is expressed in the following quote. And last, but not least of course, [as a physics teacher] you have to feel that you have the vision to make at least 80% of your students want to become a physicist after taking your class. This means that a physics teacher needs to able to make school physics interesting enough to motivate new students to take physics, below expressed by the same physics lecturer, later in the interview. A really good upper secondary teacher has an incredibly hard job to do, in meeting the learning goals and still be able to make the students feel that physics is really fun, something that they want to continue doing. In the physics expert discourse model, the choice to become a physics teacher is understood as a deviation from the obvious path to become a physicist, taken by everyone who is talented enough. A valued professional identity performance might for example be an expressed desire to work in physics research as a physics expert. However, the choice to become a teacher involves movement away from the research front and teachers are therefore likely to be understood as unsuccessful or deviant. It appears that there are no highly-valued ways of performing a teacher identity within the physics expert model. The physics expert model was very prominent in our interviews, continually resurfacing in the talk of both physics lecturers and mentors. The education lecturers also related to this model in two specific ways: first and foremost, the education lecturers rejected the assumptions of the physics expert model, pointing out its incommensurability with the goal of creating future physics teachers. However, despite this critique, in our analysis, we could also see the education lecturers positioning themselves as subordinate to the physics expert model, framing themselves as lacking the physics knowledge needed to have a valid opinion about the needs of future physics teachers. In this respect, the talk of education lecturers also contributed to our conceptualisation of the physics expert discourse model. We set out to investigate the discourses of teacher educators as a context for trainee physics teachers identity performances. Our first research question asked what discourse models could be identified in the talk of the teacher educators that trainee physics teachers meet during teacher training. Here, we identified four discourse models from the talk of physics teacher educators. These are the practically well-equipped teacher model, the critically reflective teacher model, the curriculum implementer model and the physics expert model. The models differ in their inherent understanding of what the parts of the programme are trying to achieve, framing them in relation to a particular goal. A graphical representation of all four models is shown in Fig. 5. The results in this paper are based on discourse analysis of transcripts of interviews with nine teacher educators. As such, our data naturally says a great deal about the educators themselves and the local system of education. One question that may be asked is whether we can expect to have accessed all available discourse models in this system? The short answer is no, we do not believe that it is possible to gain access to all discourse models in play in an environment by interviewing a limited number of central actors. However, we do believe that the models we did see are present in these environments, and that they are worthwhile describing and considering in the context of creating a better (physics) teacher education. There may indeed be other important discourse models that speak to our research questions. However, we believe that that does not diminish the validity of the models that we have found. Another related question is the extent to which discourse models identified in the talk of teacher educators say anything about discourses trainees meet and participate in? Participating in an interview is a very different context to teaching physics for example, and the experience of being interviewed of course puts the interviewee in a very different position (performing a different identity) than teaching. Clearly, we cannot be sure that the discourse models, created from what educators say in an interview, are also enacted in the classroom (cf. Säljö 1997). However, it would also be very surprising if there were no relationships between the discourses identified in the interview situation and how educators talk about the education and content when meeting trainee physics teachers. Discourses are not individual traits, rather they are repertoires shared and repeated between people (Jørgensen and Phillips 2002). During the interviews, the educators draw on the discourses available in their environment and we thus expect that our discourse models, whilst constructed from the interview situation, are available in the wider institution. As such it is reasonable to expect these discourse models to also be available to trainees and that they will thus be part of the discursive structures framing their identity performances. Moreover, we suggest that the discourse models we have identified have wider relevance for our understanding of physics teacher education. A well-known issue in teacher education is the difficulty in integrating educational theory, content knowledge and practicum into one coherent programme (Etkina et al. 2017). In our study, we claim that both the physical separation and the lack of contact between education lecturers, physics lecturers and mentors makes our system particularly suitable for examining this issue. The fragmentation is reflected in our results where only one of the four discourse models, the practically well-equipped teacher model, was used in all three environments. The discourse models we have constructed reflect properties of our particular system of physics teacher education, and may not necessarily apply to the reality of physics teacher education in other countries. However, we believe that the four discourse models can be valuable as a lens that researchers and educators in physics teacher education can use to view their own training programme. The four ways of understanding and valuing the physics teacher education we found are in many cases incommensurable. Although we set out to document this kind of fragmentation, the extent of the lack of coherence in the system surprised us. Taken alone, none of the models that we have constructed from the talk of educators provide a way of viewing the education as a meaningful whole. Nor do the four models appear to serve different goals that together contribute to what a physics teacher needs to become. Rather, each model functions within its own system of logic with none of them seeming to allow enough leeway to be able to view the whole of the educational programme as relevant. Each model unintentionally devalues those aspects of teacher education that are not part of the model. We find no evidence in our interviews that there is any kind of overarching, integrated model that views all the parts of the physics teacher training programme as useful contributions to a common goal. The curriculum implementer model is the only model where the educational programme as a whole could potentially be understood as relevant, but even this model frames some of the actual practices within the programme as irrelevant. We believe that none of the goals of the four models we have identified would be viewed as inherently problematic if presented separately to educators. The problem is more that educators need to question whether their default understanding is appropriate for trainee learning in all situations. Take for example the physics expert discourse model, which was dominant amongst physics lecturers and mentors in school. The dominance of this discourse model is potentially problematic. The physics expert discourse model does not have a particular type of teacher as its goal at all but rather a physics expert. The reasoning, of course, is that ‘what is good for creating a physics expert is also good for trainee teachers’, but this notion is not necessarily true and totally overlooks ideas about pedagogical content knowledge (cf. Sperandeo-Mineo et al. 2006). For example, a sound knowledge of Newtonian mechanics is absolutely essential for a physics teacher. However, given the limited time we have with trainees, one can question in what way the knowledge of how to mathematically solve quantum mechanics problems in detail is meaningful to pre-service teachers (Johansson et al. 2016). The curriculum implementer discourse model challenges the assumptions of the physics expert discourse model by introducing the notion of syllabus physics—suggesting that knowledge of physics at the level that the trainee teachers will teach would be more useful than advanced level physics not dealt with in schools. In the curriculum implementer discourse model, syllabus physics is put forward as a much better alternative to ever-deeper advanced physics studies for trainee teachers, whereas in the physics expert model, more physics is always better by default. We suggest that this situation with fragmentation and competing models could in part be a consequence of lack of communication between the different sections of the programme, where each is responsible for its own courses. Thus, even though there are common programme goals that have been accepted at some point, the fact that there are very different systems of meaning in the models suggests that the interpretation and implementation of these goals differ widely. From a policy perspective, none of the discourse models we identified are at first glance in direct conflict with the Swedish upper secondary school physics curriculum. Naturally, the curriculum implementer model lies closest to the curriculum, explicitly focusing on preparing pre-service teachers to implement it. The curriculum itself focuses on development of conceptual and procedural physics knowledge and as such is well in line with the physics expert discourse model. However, whilst the curriculum describes a range of purposes of learning physics, such as promoting democratic citizenship and everyday physics understanding, the physics expert model only focuses on one of these, the recruitment of new physicists. A second policy document—the Swedish Higher Education Ordinance (Swedish Council for Higher Education 2014) (—regulates secondary teacher education. Here, there is support for the core elements of all four discourse models. However, the discourse models we have identified do more than just emphasise certain policy goals—they also unintentionally devalue and undermine those goals that are not explicitly part of the model. Consequently, whilst none of the elements emphasised by the different discourse models are in conflict with Swedish policy documents, the devaluing of goals that are not part of a particular model is in stark conflict with the holistic nature of the Swedish Higher Education Ordinance. Our second research question asked what physics teacher identity performances we might expect to be recognised and valued within the four discourse models we have identified. As Danielsson and Warwick (2014b) point out, trainees entering the system of teacher education are involved in ongoing identity negotiations facilitated and constrained by the various components of their programme. Here, the discourse models can be understood as both enabling and limiting which professional teacher identity performances can be recognised within the educational programme. In our analysis, there is clearly no single way of performing a professional physics teacher identity that would be simultaneously recognised and valued within all four discourse models. In the practically well-equipped teacher model, the well-prepared teacher is valued, but this identity performance is difficult to pull off due to the model’s framing of the educational programme as lacking (in fact a more credible identity performance based on this model is that of the practically ill-equipped teacher—someone entering the teaching profession without the practical skills needed for the job). In the curriculum implementer model, public servant identity performances are valued where teachers work towards the overarching goal of implementing the curriculum. However in contrast, the critically reflective teacher model is partly about challenging that same curriculum, framing oneself as an agent for change. Finally, and perhaps most surprisingly, in the physics expert model, becoming a physics expert is the ultimate goal, which offers no valued way of performing a professional physics teacher identity. 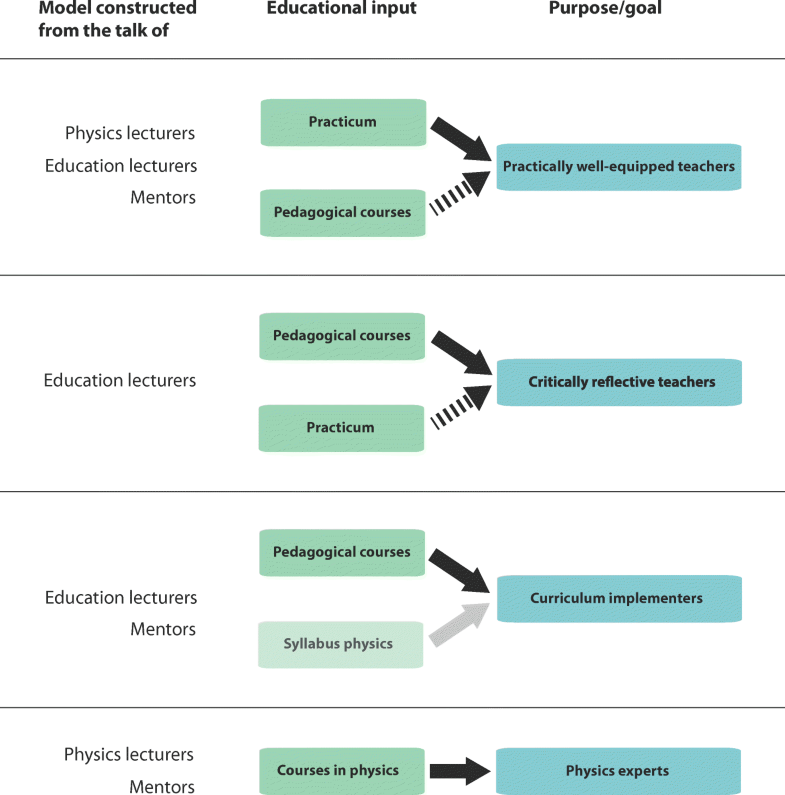 The discourse models we have presented are four, often conflicting ways of understanding how the educational content of the physics teacher training programme relates to becoming a physics teacher. We suggest that when progressing through their programme, moving between the different educational environments, trainees will meet these four discourse models and thus have to respond to the incoherence in the discourses of the educators. Which physics teacher professional identity should they be performing? One approach would be for trainees to adapt to and participate in each model as it arises, performing different physics teacher professional identities in different contexts. However, it is unclear how this could be achieved. Can we expect trainees to adapt to each discourse model they meet, and if so how? Another question is which model or models trainees take with them from the education—what sticks? Can students develop the ability to see their educational experience through a number of perspectives, or will trainees adopt just one model, choosing to understand what it means to become a physics teacher through that particular lens? Another important aspect of this question is how adapting to or dismissing the educator discourses affects the learning of trainee physics teachers. As trainees move through their educational programme, the recognisable ways of performing professional teacher identities described above bring some course content to the foreground, whilst other content is framed as less important (or even a waste of time). Take the curriculum implementer discourse model as an example. In this model, the concept of becoming a ‘public servant’ is valued. Invoking this model, trainees are likely to value pedagogical courses on understanding the curriculum (McGarr et al. 2017), but take a more shallow approach to learning physics content reaching beyond the level of the school syllabus. In order for trainee teachers to gain as much as possible from their educational programme, we argue that it is important to offer them a holistic way of understanding each part of the programme as valuable. We thus believe that a goal for any physics teacher education programme should be to present a coherent way of understanding how each part of the programme is meaningful in creating new physics teachers. Such efforts have been made, one example is the literature on reform-minded teaching (Luehmann 2007). Here, science teacher education has been designed with a particular identity performance in mind. However, presenting trainees with one single coherent discourse in this way has been shown to be insufficient for trainees to be able to perform this identity in school (Saka et al. 2013). Being recognised as a professional teacher when new to teaching means being able to perform teacher identities that are intelligible within school discourse. It is thus not enough to present trainees with a single coherent discourse within which to perform their teacher identities during the training programme. To be useful to trainees after their education, such identity performances also need to be valued in school. In the particular educational programme we studied, practicum forms part of the education. The two discourse models that were primarily constructed from the talk of mentors, the practically well-equipped teacher model and the physics expert model would thus appear to be more relevant to school reality than the other two models. We argue that it is these two ways of viewing the education that are most likely to render students recognisable as professional physics teachers in school. In the physics expert model, advanced subject knowledge is what is primarily needed to be a physics teacher whilst the rest of teacher education is unimportant. The practically well-equipped teacher model on the other hand values practical knowledge but at the same time understands the educational programme as not really giving this to trainees. If these discourses, or some combination of them, are the way of understanding the programme that trainees take with them, the picture of a competent physics teacher painted is really just someone who is well-organised and holds a physics degree. Our four discourse models have been constructed from the talk of teacher educators and as such mirror the contexts within which trainee physics teachers navigate their professional identity. However, we suggest that whichever model is invoked, large portions of the physics teacher-training programme risk being viewed as a waste of time by trainees. How can we expect trainees to experience their education programme as relevant to becoming a physics teacher when the programme itself cannot offer one single coherent way of understanding the whole programme as relevant? This problem is further exacerbated when these incompatible ways that the programme does offer do not translate easily into the future workplace (school). For teacher educators, we argue that an understanding of the four models could be used to facilitate the negotiations needed to create a common understanding of what the physics teacher programme is trying to achieve. We argue that such an understanding could also enable educators to make conscious, informed decisions about their own teaching practice. In addition, even though the discourses we describe might be familiar to some people working in systems similar to the one of our study, we have not seen these discourses described in the literature. We believe that the models in this case contribute with an overview perspective, potentially affording educators the possibility to navigate between different perspectives of their programme (something that the educators in our study were not able to do with ease). How then should educators proceed? Trade-offs are always needed in education, but the models we have identified are uncompromising in their focus on their own particular goals. Thus, we argue that educators need to continually remind themselves that they are educating physics teachers and that the default understanding they would normally employ needs to be tempered with an acceptance of the value of the goals of other models. Put simply, unreflected use of default discourse models creates unintentional limitations for student identity performances and perhaps it is only by constantly reminding oneself that there are other important goals that one can avoid overemphasising certain goals whilst devaluing other parts of the educational programme. The large amount of research on trainee identity and teacher education has resulted in a call for explicit discussion within educational programmes of the kinds of negotiations needed to create a professional teacher identity (Danielsson and Warwick 2014a; Olsen 2008; Saka et al. 2013; Varelas et al. 2005). However, such a discussion cannot be carried out in vacuum. To give trainees real possibilities to openly negotiate their professional identity, the training programme needs to be problematised as a context that steers and limits professional identity performance. Here, as we suggested earlier, it may be useful to think of the discourse models we have identified as selective filters, where each model represents a default focus on a few particular aspects of a good physics teacher as described in local and national policy documents. We suggest that knowledge of the four discourse models we have presented could help prospective teachers entering the system to understand the motivations and goals of the different parts of their programme and allow them to question which aspects are relevant for their desired future professional identity. Knowledge of the models, then, potentially empowers trainee physics teachers to understand the different goals of their educational programme and from there make informed choices about their own particular approach to becoming a professional physics teacher and the identity performances this entails. The Swedish physics teacher education programme we investigated presented a rather unflattering picture of fragmentation and lack of communication between its different parts. Moreover, since this way of organising physics teacher education, with the education divided between three different environments, is common both in Sweden and internationally, we suggest that this pattern may well appear in other programmes. The fact that we can find no coherent way for students to perform a professional identity across the three settings (physics department, education department and school) suggests that a great deal more dialogue and coordination is needed. Going forward, we are examining the role of the discourse models we have identified in the actual professional identity performances of trainees as they move through the programme. We are also exploring the extent to which similar models can be identified in other teacher-training programmes outside Sweden. The study presented in this article forms part of a larger research project funded by the Swedish Research Council (project number 2015-01891) that compares the ways in which trainee physics teachers are educated in Singapore, Finland, England and Sweden. We would like to thank all educators who have participated in the study as well as our colleagues at the Division of Physics Education Research and the Centre for Gender Research at Uppsala University for valuable discussions of the project and the text. Funding from the Swedish Research Council project number 2015-01891 is gratefully acknowledged. Etkina, E. (2010). Pedagogical content knowledge and preparation of high school physics teachers. Physical Review Special Topics - Physics Education Research, 6(2). https://doi.org/10.1103/PhysRevSTPER.6.020110. Etkina, E., Gregorcic, B., & Vokos, S. (2017). Organizing physics teacher professional education around productive habit development: A way to meet reform challenges. Physical Review Physics Education Research, 13(1). https://doi.org/10.1103/PhysRevPhysEducRes.13.010107. European Commission. (2015). Science education for responsible citizenship—a report (No. EUR 26893 EN). https://jcom.sissa.it/science-education-responsible-citizenship-report. Accessed 1 Nov 2016. European Commission Expert Group. (2007). Science education now: A renewed pedagogy for the future of Europe. Brussels: European Commission. http://ec.europa.eu/research/science-society/document_library/pdf_06/report-rocard-on-science-education_en.pdf. Accessed 10 June 2016. Osborne, J., & Dillon, J. (2008). 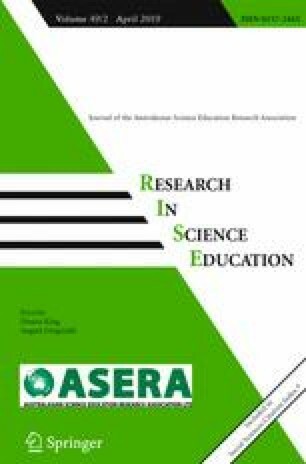 Science education in Europe: Critical reflections (Vol. 13). London: The Nuffield Foundation. http://efepereth.wdfiles.com/local%2D%2Dfiles/science-education/Sci_Ed_in_Europe_Report_Final.pdf. Accessed 14 Sept 2017. Scherr, R. E., Plisch, M., & Goertzen, R. M. (2015). Physics teacher production: Patterns of institutional engagement and faculty theories (pp. 303–306). American Association of Physics Teachers. https://doi.org/10.1119/perc.2015.pr.071. Singh, C., Moin, L., & Schunn, C. (2010). Introduction to physics teaching for science and engineering undergraduates. Journal of Physics Teacher Education Online, 5(3). http://arxiv.org/abs/1603.02950. Swedish Council for Higher Education. (2014). The Higher Education Ordinance 2014:1096: https://www.uhr.se/en/start/laws-and-regulations/Laws-and-regulations/The-Higher-Education-Ordinance/. Accessed 11 Nov 2018. Task Force on Teacher Education in Physics. (2012). Transforming the preparation of physics teachers: A call to action. American Physical Society. http://www.phystec.org/webdocs/2013TTEP.pdf. Accessed 15 Dec 2016.